Lesley Feakins, owner and operator of Trevelyan Farm, moved to the USA with her husband and family in 1989 from Southampton, UK, where her beloved New Forest Ponies roam in the wild. She has been involved with horses from a very early age, and as a child was fortunate to spend her time riding in the New Forest in Hampshire. Her background includes competing in horse trials, stadium jumping, and in dressage. 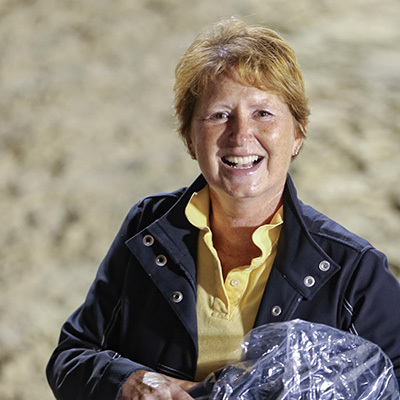 Lesley started her breeding program, which focuses on top-quality warmbloods and sport ponies, in 1999. She carefully selects her brood stock based on exceptional movement, sound conformation, and incredible temperament- all necessary to make an outstanding competitor and a lifetime equine partner. Trevelyan Farm is recognized for breeding and training some of the best sport ponies in America- with a focus on the New Forest breed. Although Trevelyan Farm mostly focuses on dressage, our horses and ponies are competing and excelling in all disciplines.Over the years, we are consistently awarded Premium Foal awards, Champion High Score Foal Awards, Premium Mare Awards, and overall wins at the prestigious Dressage at Devon as well as numerous breeding registry shows. Most recently, in 2014 we took the GIAG/USDF Breeders Champion Series with home bred Grand Champion Filly, Glamour Girl. In addition, Forrest Nymph (Forrest Flame) has gained well-deserved attention as a 2** Intermediate eventing pony.